Two years after launch, NASA's OSIRIS-REx spacecraft, closing in on a small but potentially hazardous asteroid known as Bennu, has captured the first images of its quarry, mission managers said Friday. It's the latest milestone in an ambitious attempt to study the body in detail and, eventually, to bring back samples from its surface. Five initial images, captured Aug. 17 at a distance of 1.4 million miles, show little more than a point of light moving across a field of dim stars. 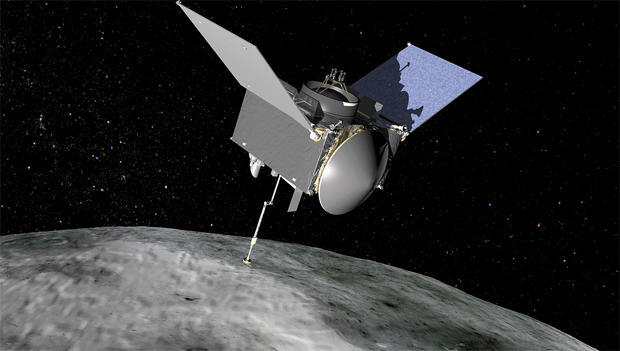 But to Dante Lauretta, the principal investigator for the OSIRIS-REx mission at the University of Arizona, they were a long-awaited confirmation the spacecraft was on course for its historic encounter. "I can't explain enough how much it meant to this team," he told reporters. "I know Bennu is only a point of light here, but many of us have been working for years and years and years to get this first image down, and it really represents the beginning of the great scientific expedition that is OSIRIS-REx." Discovered in 1999, Bennu is a 1,600-foot-wide carbonaceous asteroid in an orbit that carries it across Earth's path around the sun. It is one of the top two most potentially hazardous asteroids yet detected with a 1-in-2,700 chance of impacting Earth late in the 22nd century. The $1 billion OSIRIS-REx mission -- the convoluted acronym stands for Origins, Spectral Interpretation, Resource Identification and Security-Regolith Explorer -- is designed to study Bennu in unprecedented detail to learn more about asteroids in general and, possibly, how to divert or break up a threatening body on a collision course with Earth. Lauretta said the initial images of Bennu were "good news" to the navigation team. "First of all, the asteroid was right where we thought it was, so it's there and it's waiting for us," he said. "The spacecraft was also where it was supposed to be and pointing in (the right) direction, so our navigation team has done a fantastic job getting us on this approach trajectory." The flight plan calls for an exceedingly cautious final approach, using the spacecraft's instruments to search for any dust plumes or moons that could pose a threat to OSIRIS-REx while the spacecraft moves ever closer. Four approach maneuvers are planned through October and November and if all goes well, OSIRIS-REx will begin flying in formation with Bennu on Dec. 3, carrying out a series of close-range flybys before slipping into orbit on New Year's Eve. That milestone is just one of three major encounters coming up for NASA this fall. The agency's InSight Mars lander is more than halfway to its target, on course for touchdown Nov. 26 to explore the deep interior of the red planet. The New Horizons probe, now a billion miles and four years beyond its historic 2014 flyby of Pluto, is expected to race past a small Kuiper Belt object nicknamed Ultima Thule on New Year's Day, giving scientists a close-up look at a chunk of debris left over from the birth of the solar system some 4.6 billion years ago. "The whole fall, as I say, is going to be pretty cram-packed with exciting planetary events with InSight landing on the surface of Mars, OSIRIS-REx arriving at Bennu and going into orbit at the end of (December) and New Horizons executing the flyby of MU-69/Ultima Thule on Jan. 1," said Lori Glaze, acting director of the Planetary Science Division at NASA Headquarters. "It'll be the season of science, we will be enjoying every minute of it, and it'll be a great time for all of us. I hope everyone's ready to stay up all night on the 31st and enjoy the whole package." The OSIRIS-REx team plans to spend most of 2019 carrying out detailed mapping operations, using a laser-ranging system to chart Bennu's topography, its three cameras to characterize surface features and its spectrometers to better understand Bennu's chemical composition. All the while, the science team will be looking for the best sites to collect surface samples. "In order to do the recon, we want to get about 200 meters over the site, so we actually leave orbit and we target a 200-meter closest approach over the potential sampling sites," Lauretta said in an earlier interview. "And then we do a whole series of high-resolution imaging for mosaics so that we can piece together something literally at centimeter-scale resolution of an entire 50-meter-diameter (sample collection) ellipse." Finally, in July 2020, OSIRIS-REx will attempt to collect up to 4.4 pounds of rock and soil using a clever "touch-and-go-sample acquisition mechanism," or TAGSAM, on the end of a 10-foot-long robot arm. As the name suggests, the spacecraft will move in close enough so the extended TAGSAM briefly impacts Bennu's surface. Compressed nitrogen gas will shoot into the collector, stirring and lifting small rocks and soil. Some of that material will be trapped in filters for return to Earth. After backing away, the collector will be placed inside an aerodynamic sample return capsule. But OSIRIS-REx cannot leave Bennu until March 2021, after Earth and the asteroid reach the proper positions in their orbits to permit to spacecraft to make it home. "So that's over two-and-a-half years of operations at the asteroid," Lauretta said in the earlier interview. "We only touch the asteroid for that brief, five-second sampling contact. We are going to do everything we can to make sure we get the sample on the first attempt." If all goes well, OSIRIS-REx will release the sample container in September 2025 on a trajectory culminating in a high-speed plunge to the Utah Test and Training Range about 80 miles west of Salt Lake City. Recovery crews will deliver the capsule to the Astromaterials Acquisition and Curation Office at the Johnson Space Center in Houston where Apollo moon rocks are stored. Then, nearly a decade after launch, the science team will get its collective hands on the soil samples to begin the long-planned analysis.